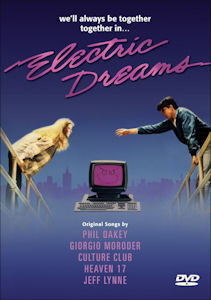 Electric Dreams DVD (Region 1) Color. Widescreen. Virginia Madsen, Lenny Von Dohlen, Maxwell Caulfield. One of the classic, era-defining films of the 80 s finally released on DVD Miles is helpless, hopeless and about to blow a fuse. He has a problem. His computer Edgar has decided to wreck his life. He s ruined his credit rating, run up his phone bill, cancelled his plane reservations, locked him out of his house and now he s trying to steal his girlfriend.